Islam is growing steadily in the UK while Christianity is declining, and yet the average Christian knows very little about the Muslim faith. Sure, everyone has an opinion about Islam, but is it one based on fact or fiction, on truth or stereotype? To be faithful servants of our Lord, our interactions with Muslims ought to be respectful and informed, but to study Islam is a daunting task. Where would one begin? Understanding the Muslim’s holy book, the Qur’an, would be a good place to start. If only there were a book to help guide the Christian to the most important aspects of the Qur’an and Muslim theology. If these musings ring true, then What Every Christian Needs to Know About the Qur’an is the ideal book for you! 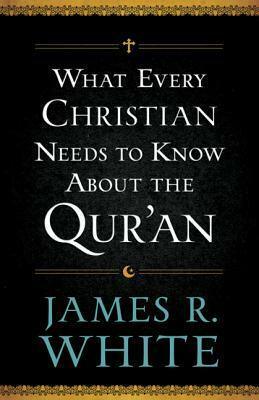 Veteran Christian apologist James White has battled Mormonism, Jehovah’s Witnesses, Roman Catholicism and even King James Onlyists, but of late he has turned his attention to being one of the foremost Islamic experts and this book is the firstfruits of his deep study of Islam and many debates with Muslims. The Perfection of the Qur’an? Transmission and Text / Is the Qur’an ‘corrupt’? The earlier chapters are more a simple retelling of Islamic history and belief, while in the latter chapters White goes on the offensive. White believes that it is important for Christians to have an understanding on each of these issues. They reflect “what Christians need to understand about the Qur’an’s teaching particularly as it impacts our interactions with Muslims and our thinking on events throughout our world.” (loc 84). So White is not just after sharing information, but about helping our evangelism. The first thing to mention about What Every Christian Needs to Know About the Qur’an is White’s approach. Rightly understanding what Muslims believe about God, Christ, salvation, and God’s revelation is vital, and with such an abundance of material to sort through there can really be no shortcuts if we want to do things rightly and respectfully. The Muslim must be allowed to speak for himself in order to be fairly represented, and White aims to do this very thing here. This results in extensive interaction with Qur’anic texts as well as quotations from the Hadith to help provide clarity. As an example, the chapter on Christ looks at each time the Qur’an mentions Christ (‘Isa). Such an approach is to be commended for it’s fairness and integrity. White’s thoroughness is also reflected in the detailed endnotes for each chapter, providing either his comments or additional information, that are helpfully kept from the body of text so as not to over-complicate. These should not be missed as there is some real gold to be found in them. As any Christian would appreciate a fair representation, Muslims also will appreciate Christians doing the same for them. To achieve this, White shows real restraint by refraining from hyperbole and charged rhetoric. At times White even defends the Qur’an or Muhammad from lazy stereotypes or attacks. Many dismiss some of the more supernatural elements in Islam, and yet as Christians we believe God can and does interact with His creation, so we cannot have double standards by adopting a naturalistic worldview when evaluating Islamic claims. White also calls Muslims to the same standard, as many employ liberal unbelieving scholarship when it comes to criticizing the Bible’s integrity, ignoring the fact that these same scholars would reject the Qur’an out of hand also! Unfortunately, White’s approach has a drawback that also reflects my most significant criticism of the book. With such an attempt at fairness comes a degree of thoroughness that I expect that many will find overwhelming. Some will be unable to follow the tight argumentation and will get lost in the forest due to all the times White stops to examine the trees in detail. Yes, this tree is also wonderful, but did you notice that we lost a couple of people back at the last bend? The “every Christian” aspect of the book’s title is undermined through this approach making the content less accessible for some. This is also a reflection of our culture’s current inability to engage in prolonged thought, but it is a reality that writers must indulge nonetheless. To help combat this, simple summaries at the end of each chapter may have been beneficial; a short restatement of the most important details in the chapter would keep the struggling reader afloat. These topics may truly be What Every Christian Needs to Know About the Qur’an, but need every Christian follow each detail of each argument of each chapter? The book’s title implies a level of accessibility and simplicity that I don’t quite think is present in the work. What Every Christian Needs to Know About the Qur’an may be better entitled What Every Serious Christian Needs to Know About the Qur’an, since some will not have the patience for what is required from a book that appears to want such a universal audience. Speaking for myself, I learned a great deal from this book about Islam and am extremely thankful for this book. I was also very grateful for White’s thoroughness. There’s nothing better than hearing your opponent express their views in their own words. White even represents disagreements within Islam when he could have only represented one side and taken an easy cheap shot instead. At times the large block quotes became tedious though. However with that said, I cannot praise this book highly enough! I know of no other introduction to the Qur’an with this level of fairness and detail. White’s representation and eventual criticisms of the Qur’an are fair and laser-sharp, ignoring the easy shots that others take at Islam and getting straight to the most important points in the discussion. White is not just an apologist but a theologian, he is not simply attacking Islam from no sure foundation of his own, he is constantly drawing the reader’s attention to the most important theological issues dividing both religions. What Every Christian Needs to Know About the Qur’an is a real step forward in serious dialogue between Islam and Christianity. If every Christian read this book carefully we would avoid oversimplification and stereotype and be better apologists to Muslims, and with the Spirit’s empowering, win more to Christ.